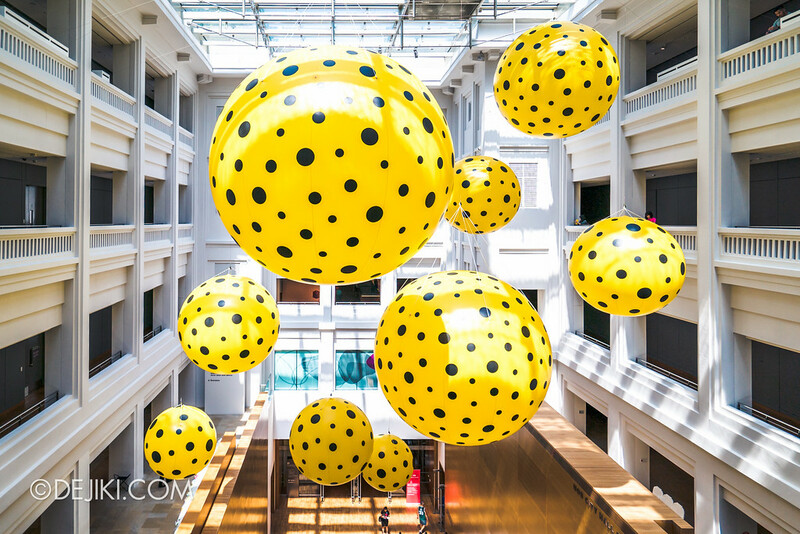 This is an amazing exhibition with some 120 works spanning seven decades of works by Yayoi Kusama. It’s definitely a must-go, which is why this entry is a megapost. 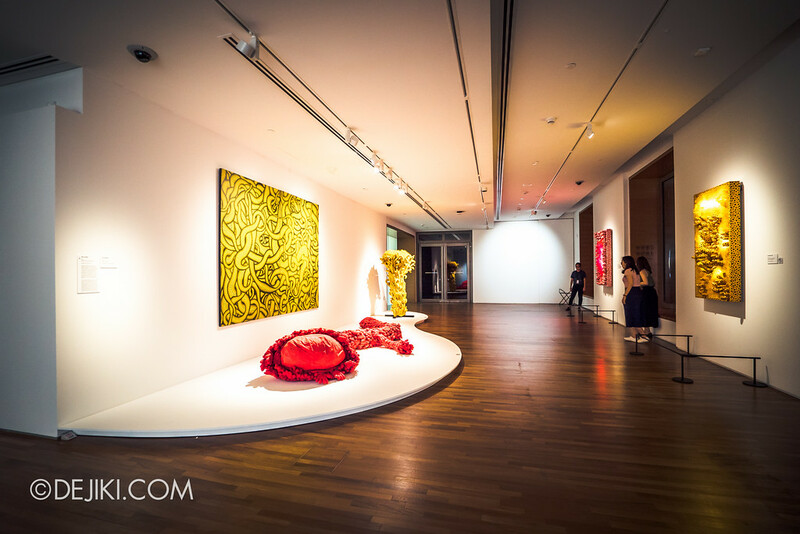 There are two sections: the Photo Tour highlighting the art first, and followed with a pictorial Exhibition Guide so you can know what to expect when you visit. If you can’t visit, enjoy the photos then! I will be posting more on Instagram (@dejiki). 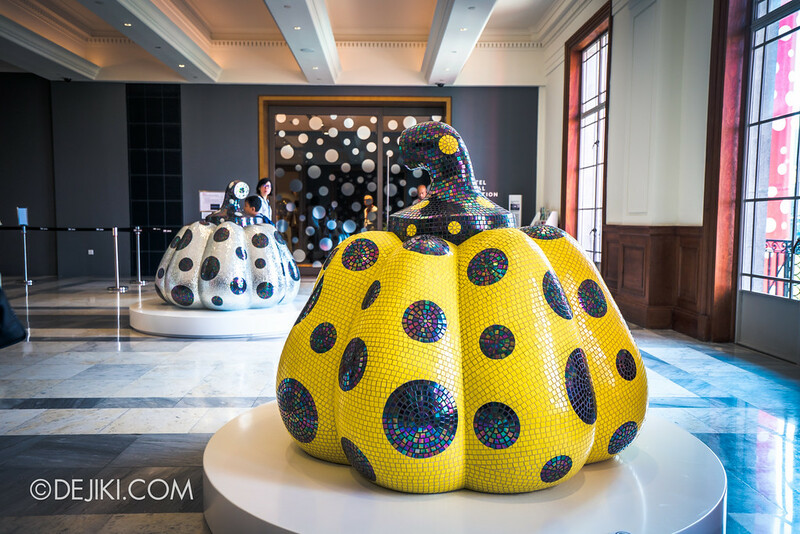 Dots, nets and pumpkins – recurring elements in Kusama’s work form the introductory arc of this exhibition. 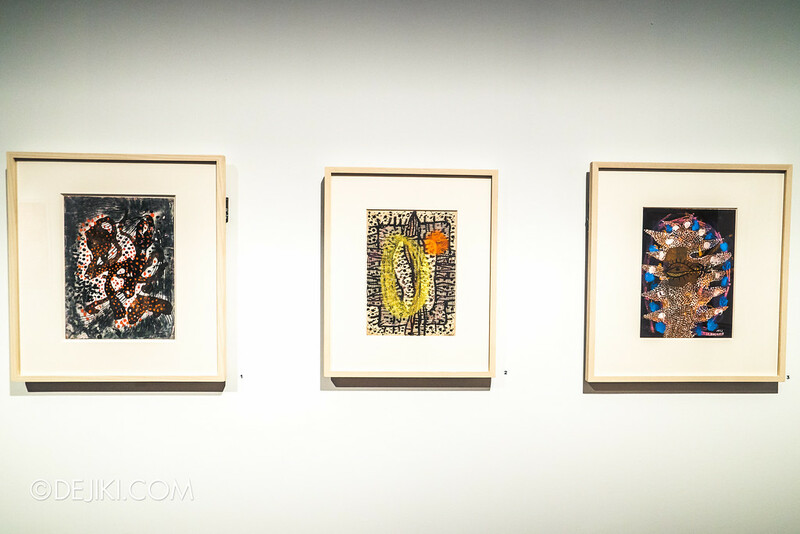 As a meticulously consistent artist, themes and styles can be drawn from her early works from 1950s. 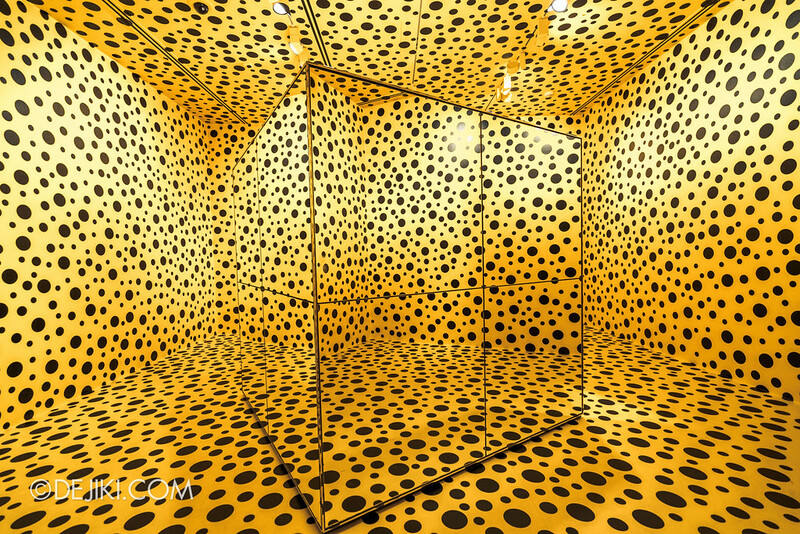 A yellow room completely covered with black dot stickers, with a dual-sided mirror cube in the middle. 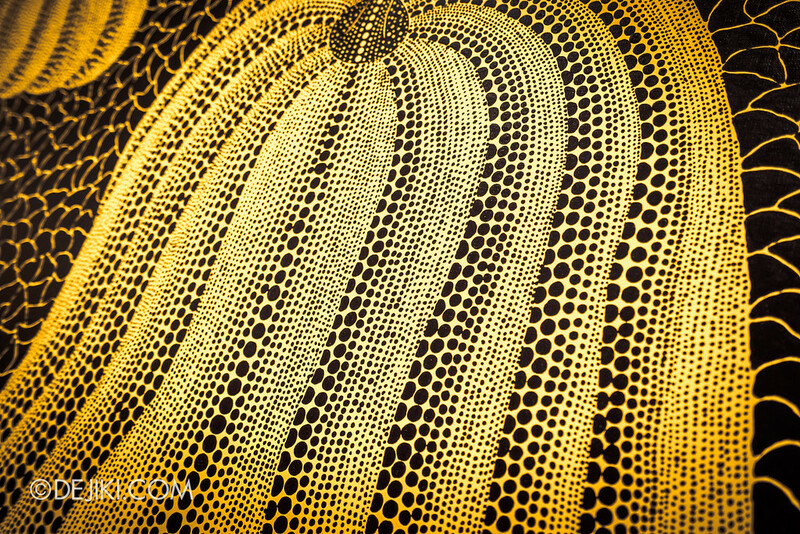 Peek inside to see the Pumpkins, which Kusama has strong attachments with since young. 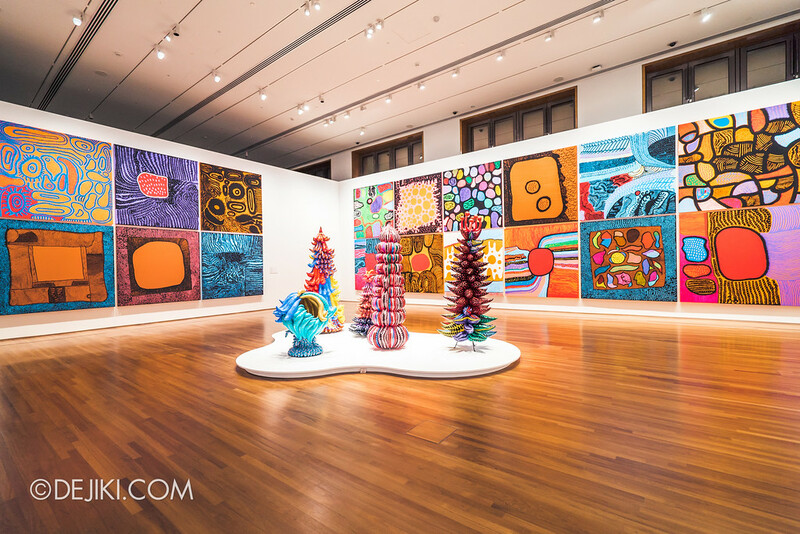 You’ll see her iconic Pumpkins in numerous forms in this exhibition. Invisible Life. 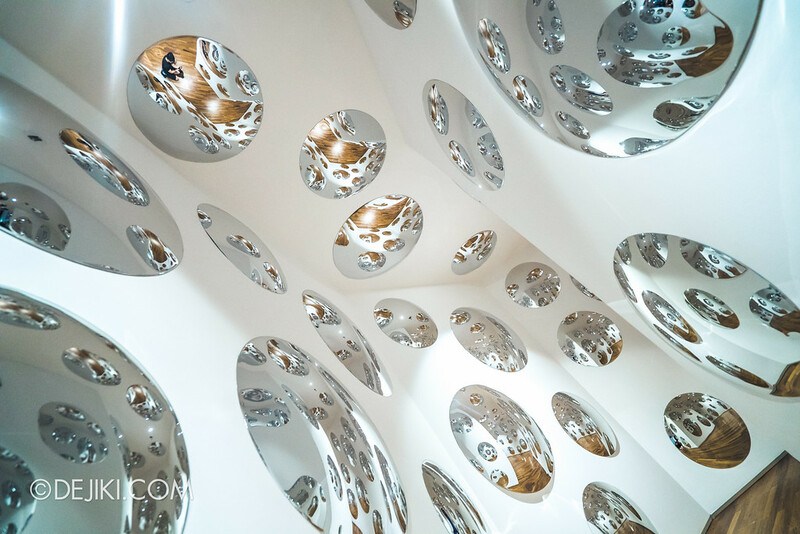 Convex mirrors, reflecting the dots around and within. 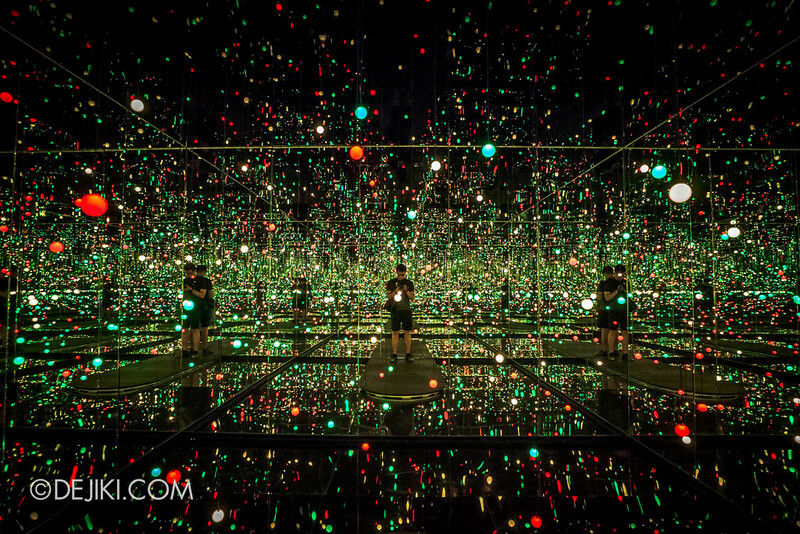 Infinity Mirrored Room: Gleaming Lights of the Souls. 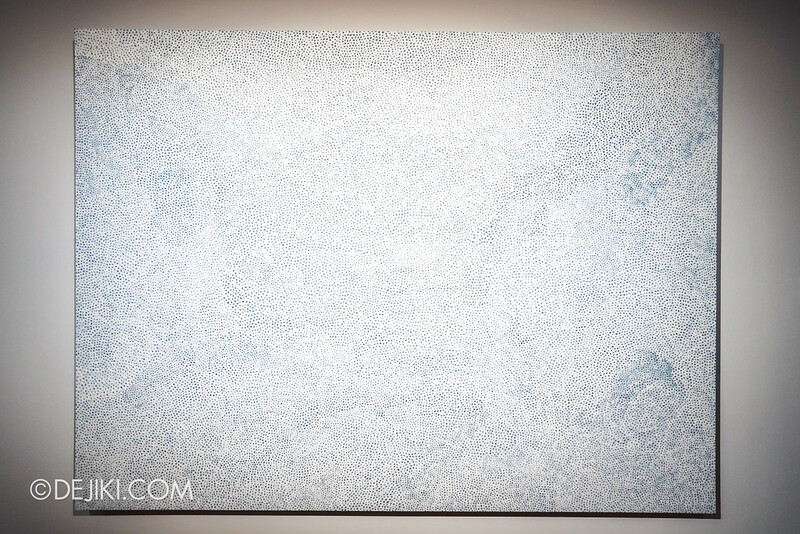 The most popular piece is no doubt the installation within this white box. 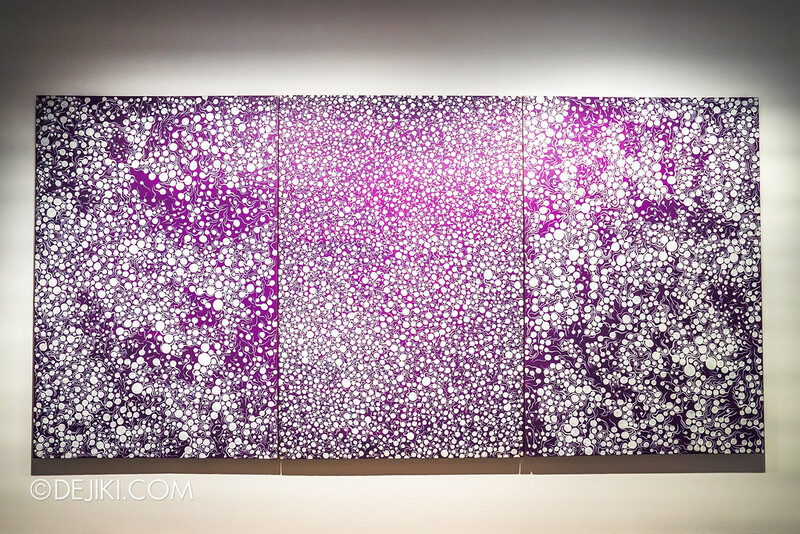 Dots and nets from the paintings are transformed into a spell-binding, yet fleeting experience. (Find out why in the Guide below). 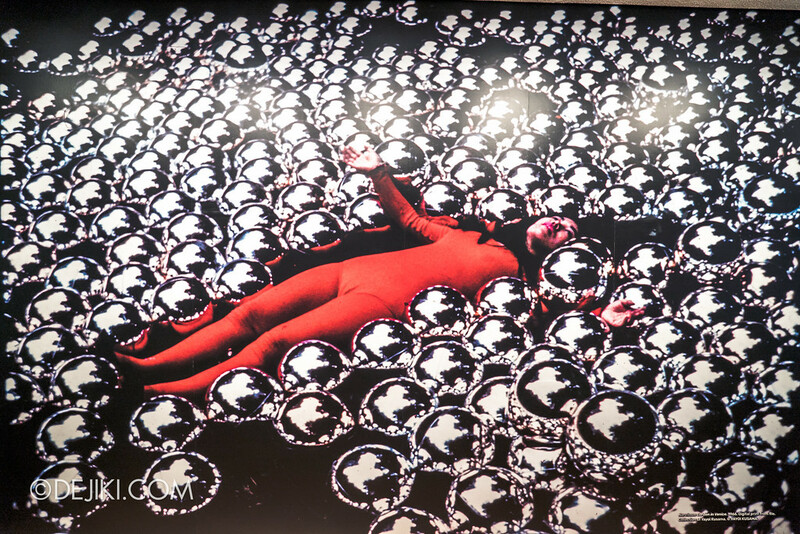 In the Restricted section, you can see some of Kusama’s art in the form of documented performances, including a few on self-obliteration. 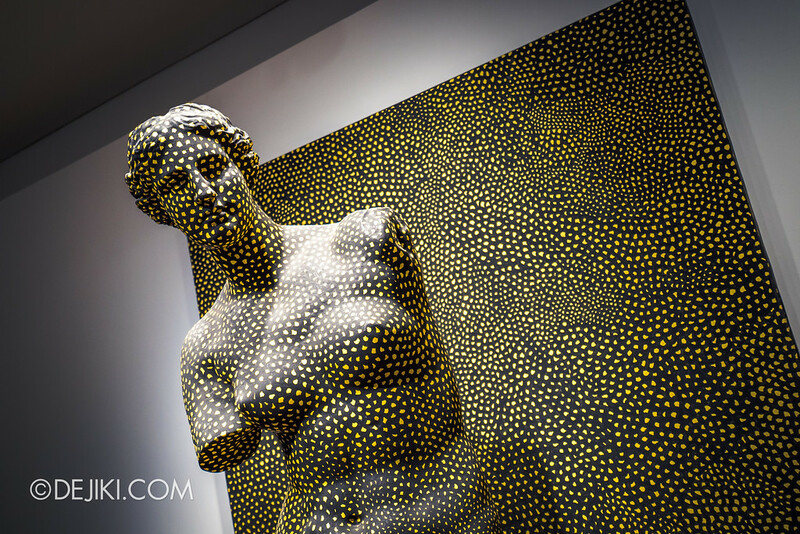 This is followed with pieces created as dialogue with the human body. a Manhattan Suicide Addict. 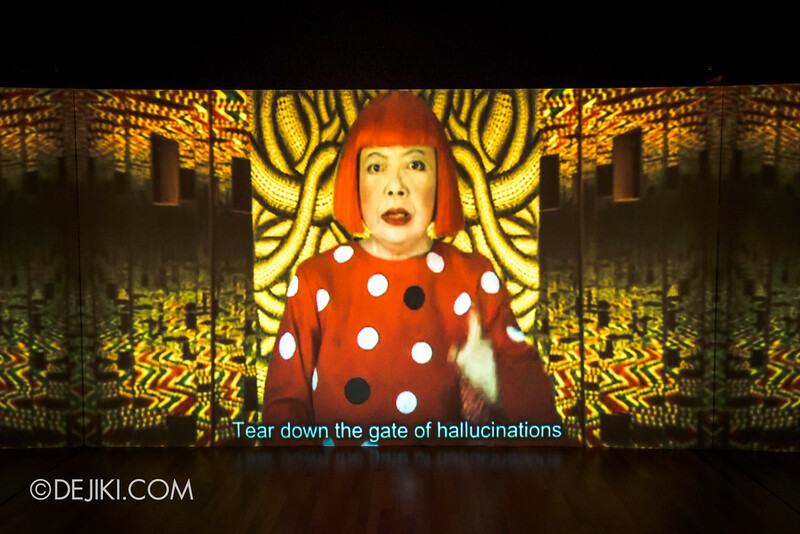 A video installation where Kusama sings. Love Forever (2004-2007). 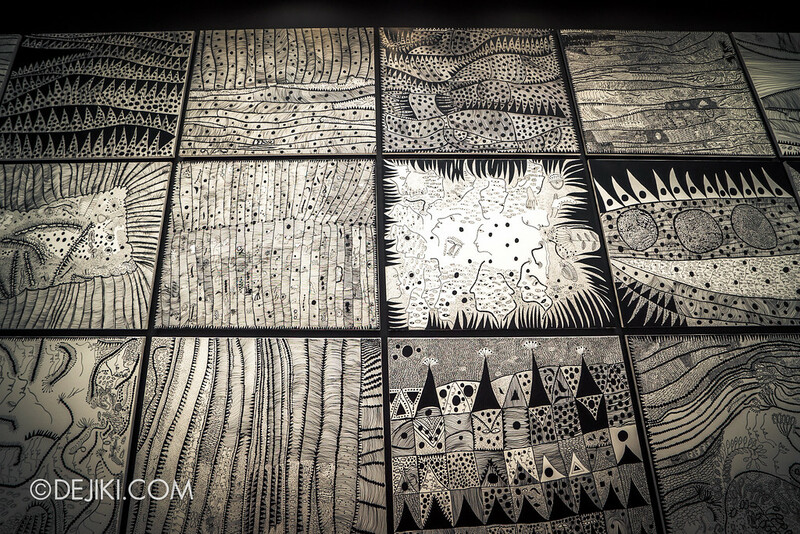 A series of 50 silkscreened canvases that were initially drawn by Kusama with black felt markers. I Want to Love on the Festival Night. 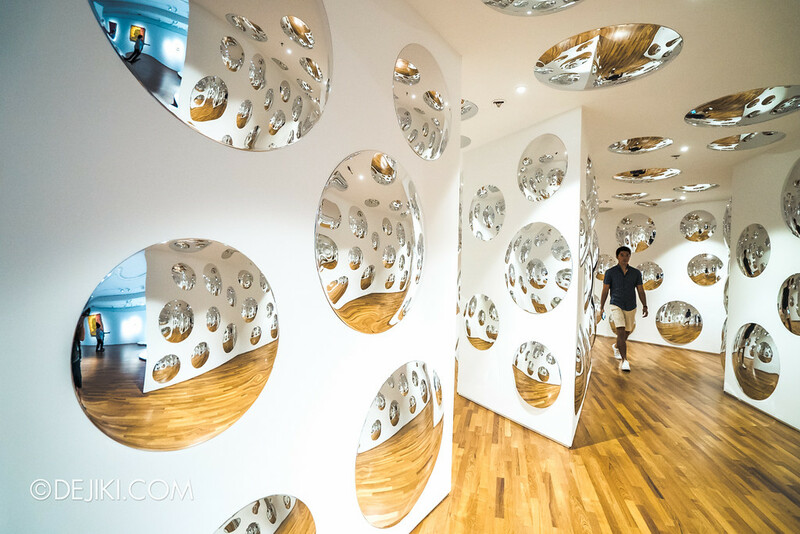 Surrounded by the Love Forever canvases, this mirror peepbox cycles through trippy light patterns, and unlike the other two mirror installations, there are multiple openings to share the love. All My Love for the Tulips, I Pray Forever. 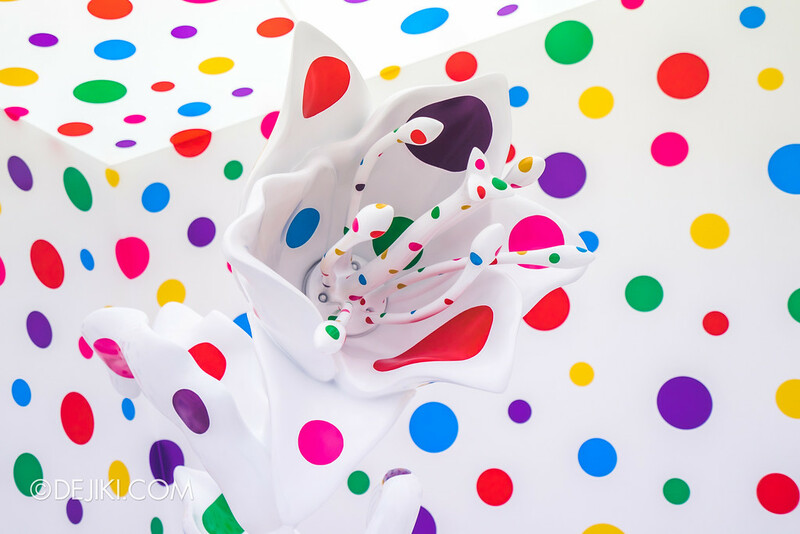 Three potted tulips set in a white room obliterated with colourful dots. My Eternal Soul (2009-) series. 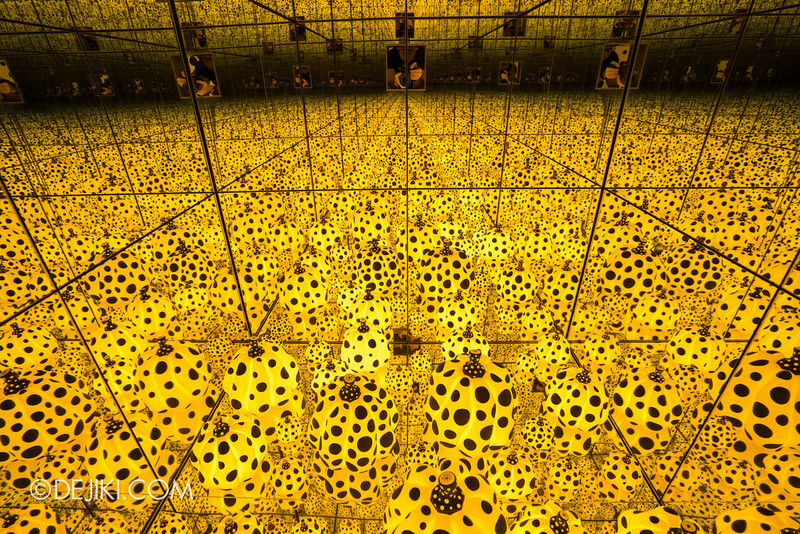 Massive paintings reflect on Kusama’s connections with patterns, obsessions, and the infinite. 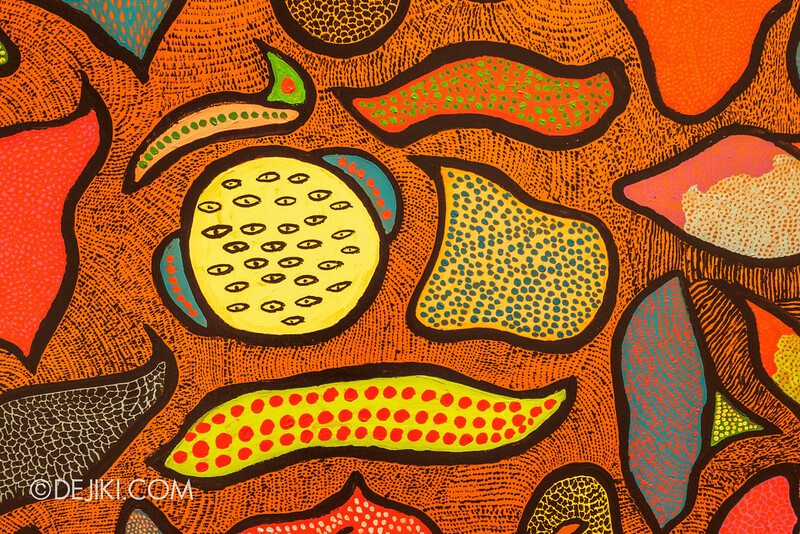 She has painted more than 500 unique pieces already, and some of the ones exhibited here were shown for the very first time. 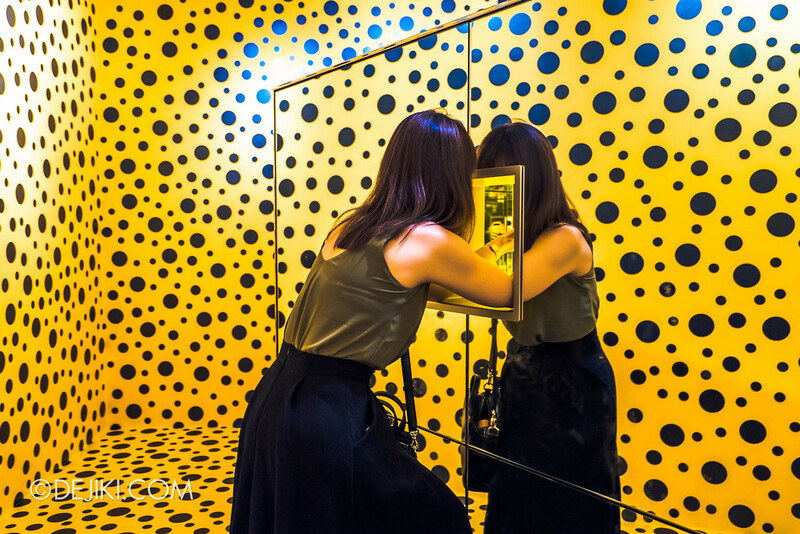 The exhibition concludes with a mega installation, a new iteration of Narcissus Garden, which Kusama first staged at the 33rd Venice Biennale. Narcissus Garden (2017). 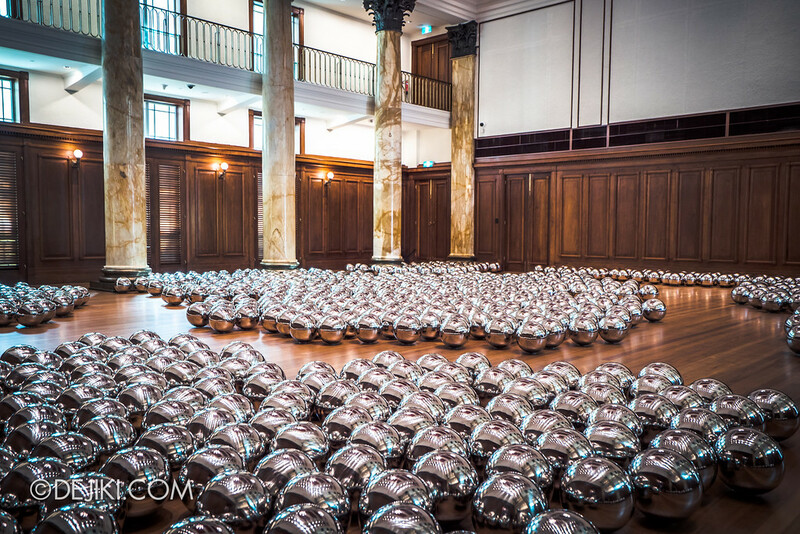 Installed at the City Hall Chamber are some 1,500 steel spheres, each precisely set (but not firmly held) with a plastic base. 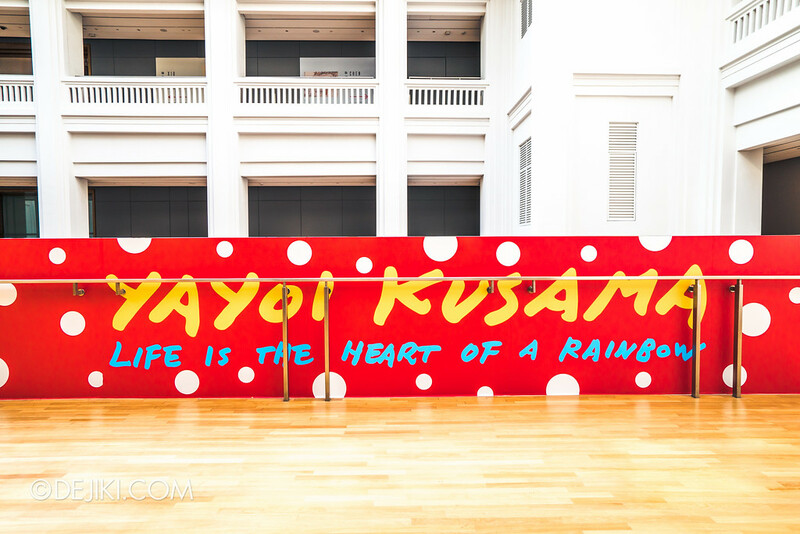 And that concludes our tour of Yayoi Kusama: Life Is The Heart of A Rainbow. 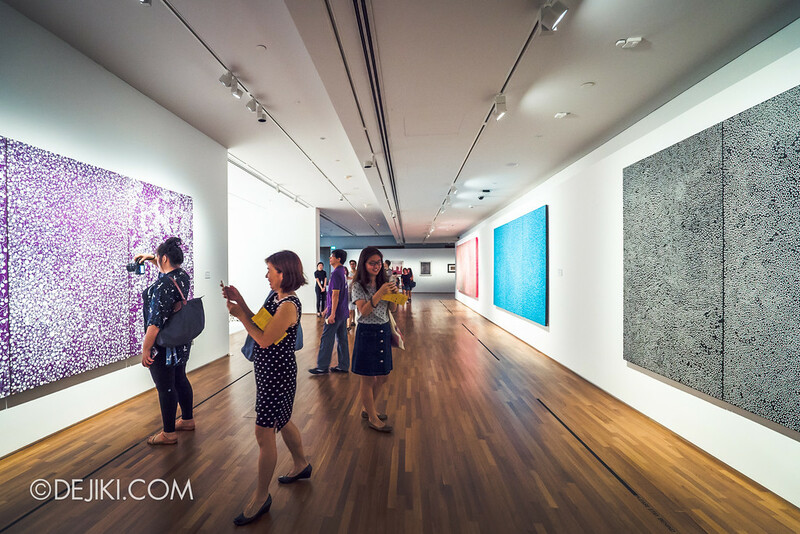 While Singaporeans/PRs can enjoy free admission to National Gallery Singapore, this exhibition is a Special Exhibition which requires a separate ticket. 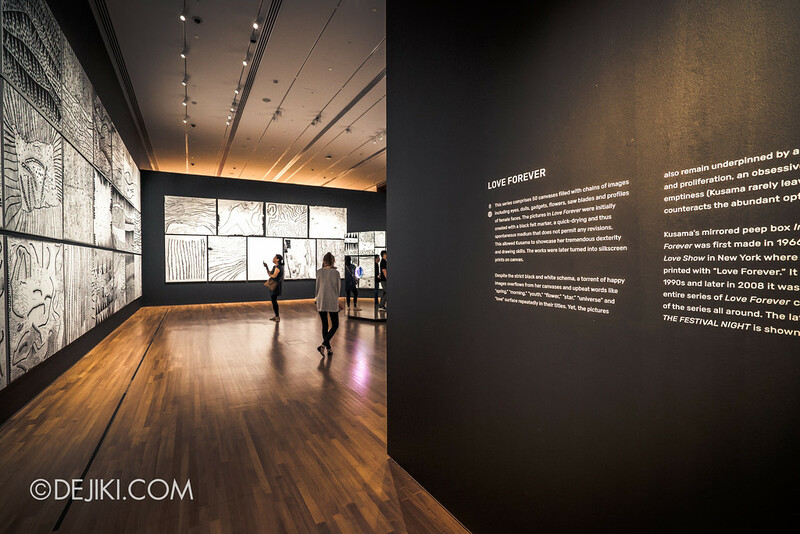 On top of that, you need to select a timeslot to visit as time-entry admission is enforced at this exhibition. *Concession-holders: Children aged 7–12, Seniors aged 60 and above, Full-time National Servicemen excluding foreign personnel, Overseas students & teachers. Please visit the National Gallery website to buy tickets online. 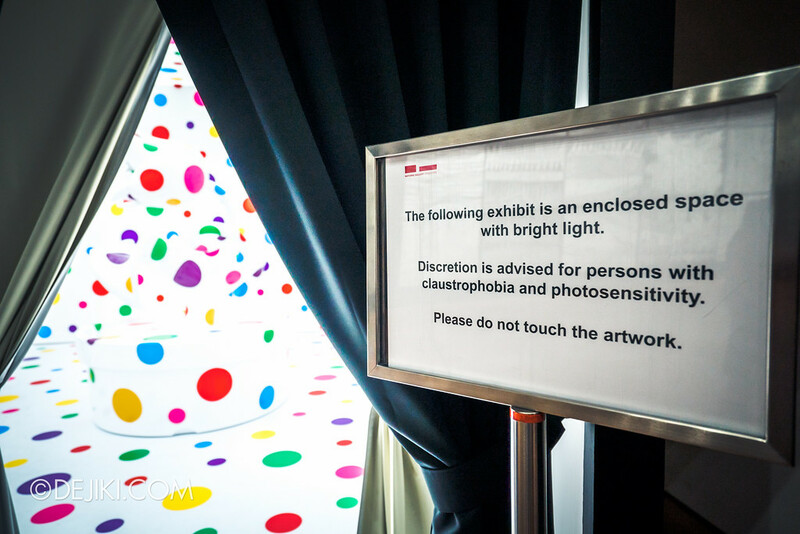 Update: The YAYOI KUSAMA exhibition is not participating in the Open House. Normal admission charges apply. 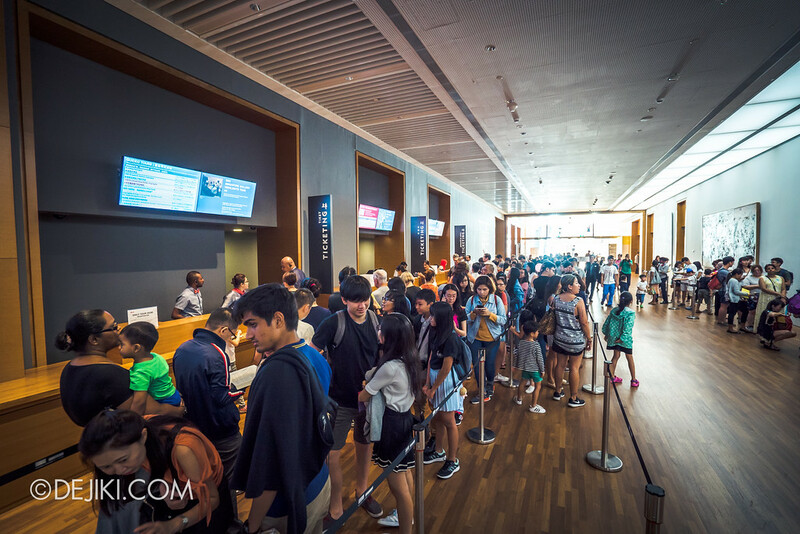 This is the queue to buy tickets. Not sure if you’re impressed, shocked, or deciding whether you should even show up. 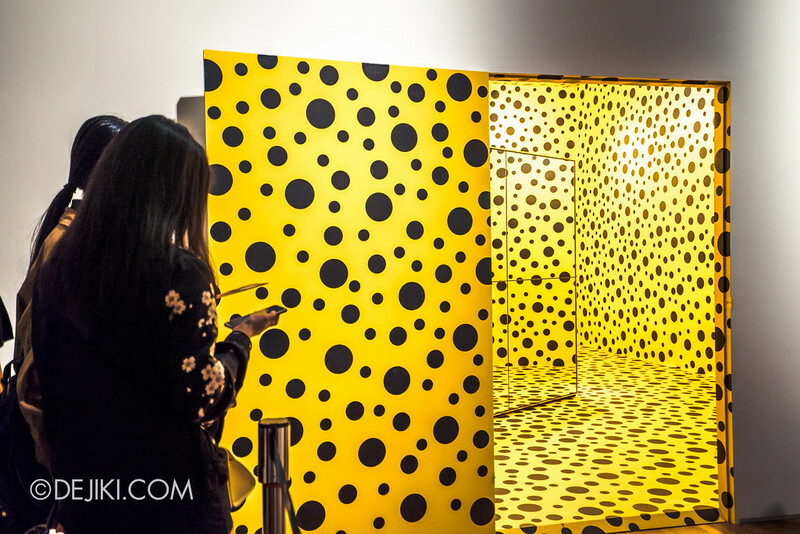 Just be prepared for the madness, like Kusama’s past exhibitions overseas. 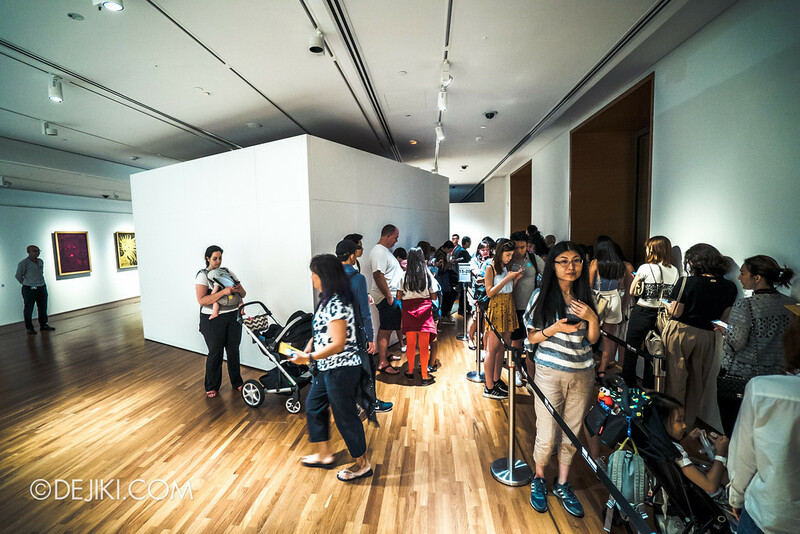 The museum will enforce time-based admission, thus walk-ins may not be available and you might need to return at a later timeslot. 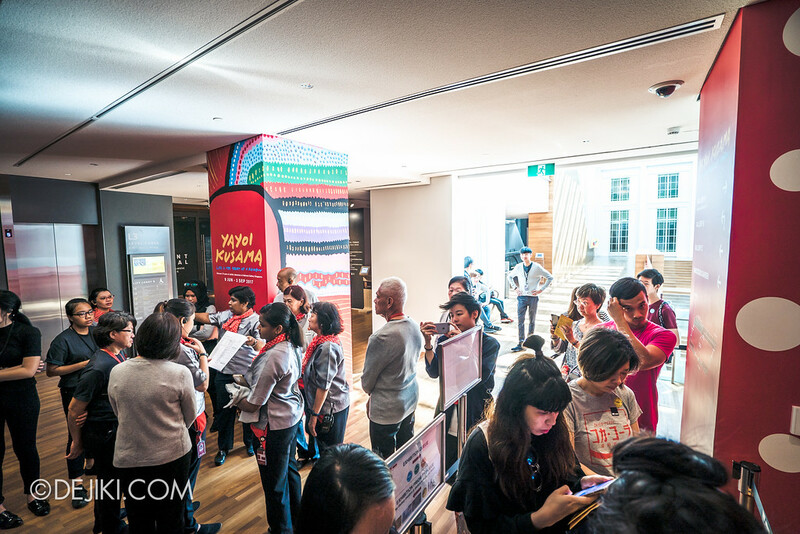 You can book your tickets online to reserve your timeslot, and visit the museum to collect your sticker. 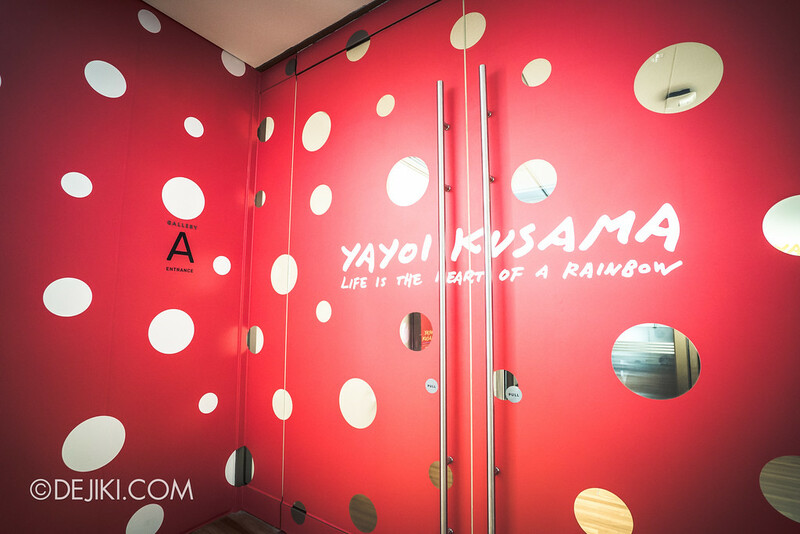 Yayoi Kusama: Life Is The Heart of A Rainbow is located at the Singtel Special Exhibition Gallery, Level 3 of the City Hall building. From the ticketing counters (Basement 1), take the escalators behind the ticketing area, then the escalator again up to Level 3. You will see the exhibition banner on the railings. Minutes before the official opening of the exhibition: the Gallery staff are still being briefed in the open. Stuff like re-entry, where and when to check the tickets. 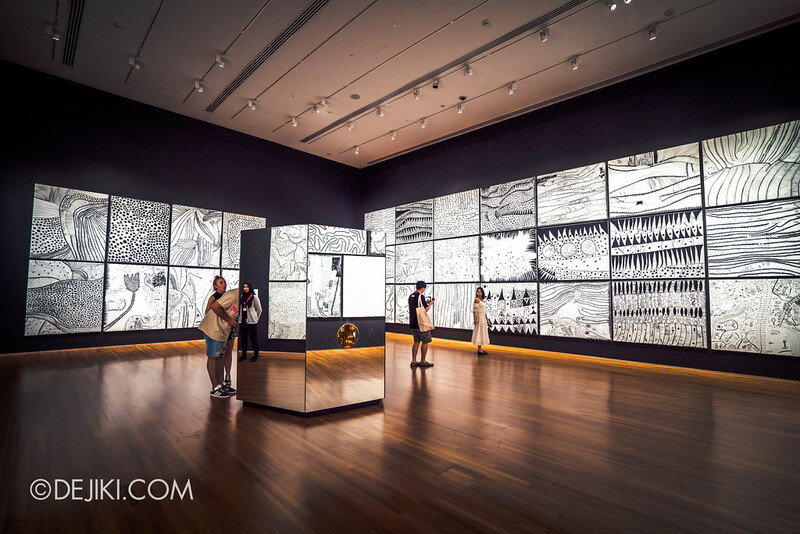 How many visitors per gallery. 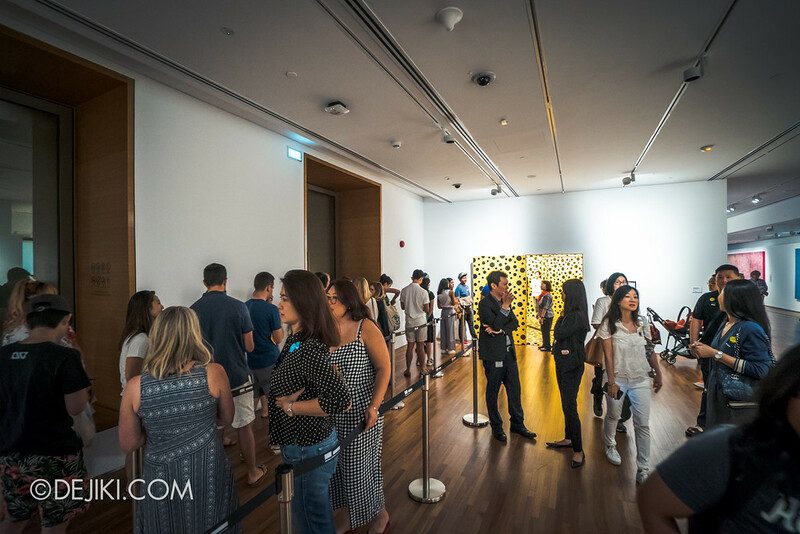 The chatter goes on, and the exhibition’s opening was delayed, much to the frustration of those waiting in line. Afterwards, we found out that the staff (probably because the deluge of varying instructions) did different things at the entry points that confused guests. Guess it will be ironed out in a few days? What’s the meaning behind the sticker colours, and the blue/black variants of the National Gallery sticker (not pictured)? 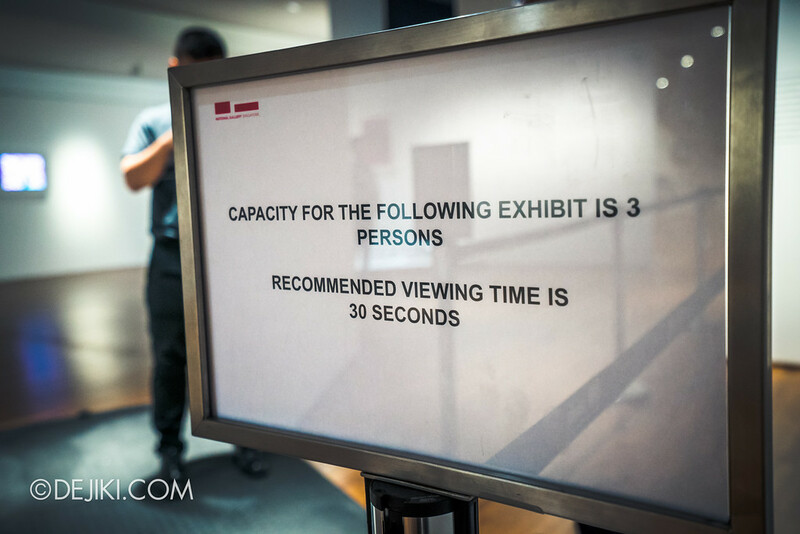 Long wait times are expected at installations and entrances to the galleries. That’s right. This is not the only one. 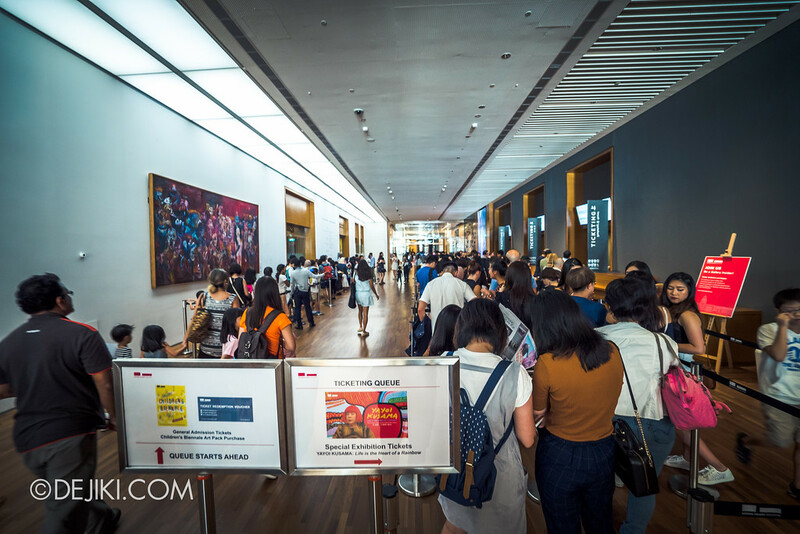 The exhibition is split into three galleries, each with its separate queue line in case of crowds. 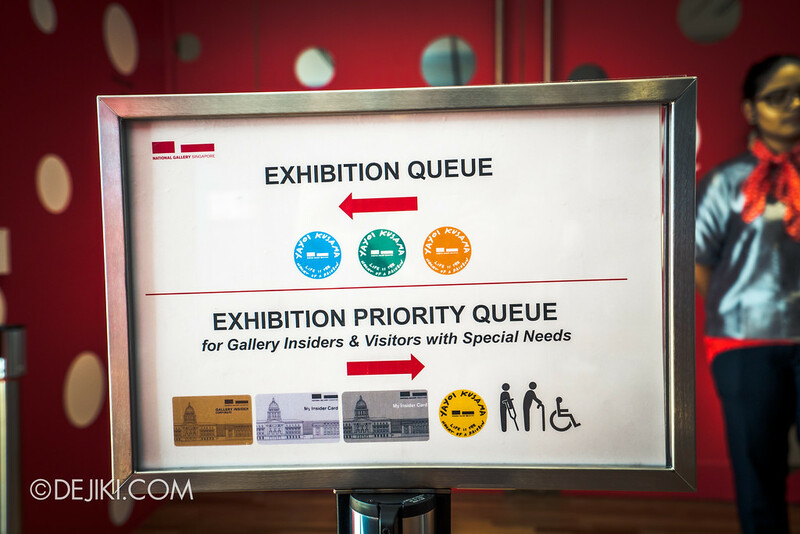 While the Gallery staff advised that you could technically “start from any gallery”; another one told us later that all visitors must get their tickets checked from Gallery A (this place, with the red doors). 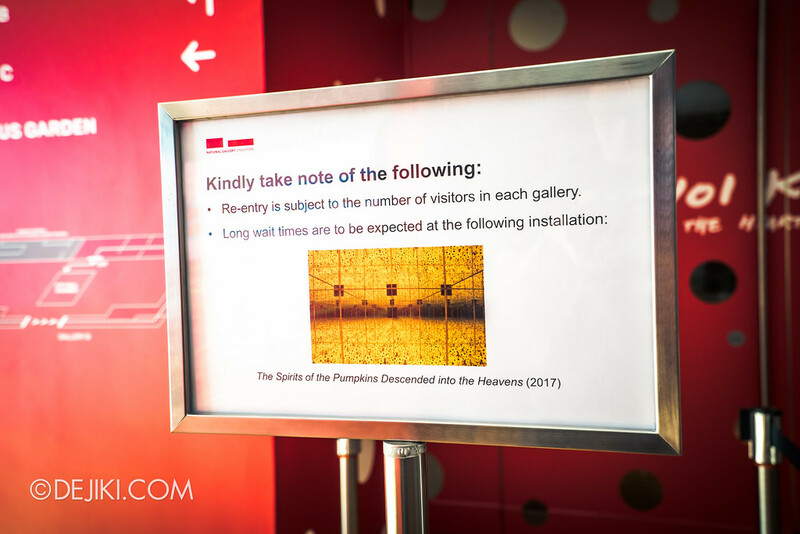 A typical queue for The Spirits of Pumpkins Descended into the Heavens, also known as the Yellow Pumpkin Mirror Room. 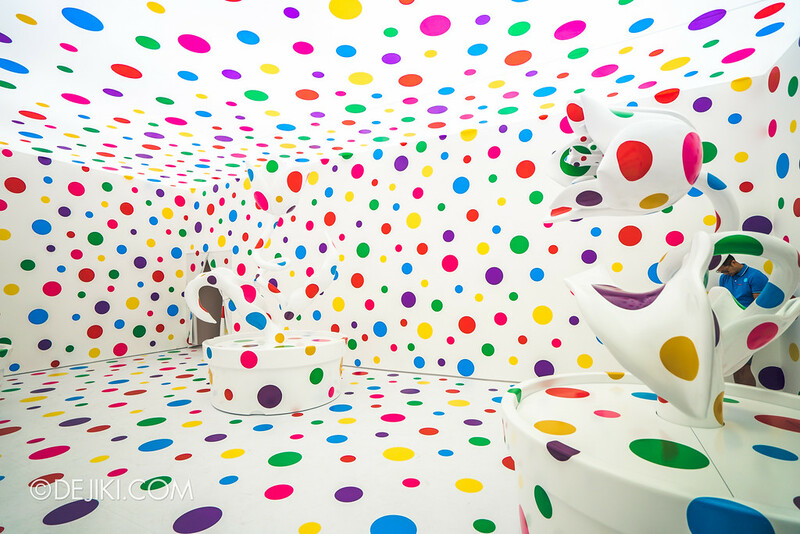 This is not an installation that you can just walk in. And the work itself sets up for the big reveal within. 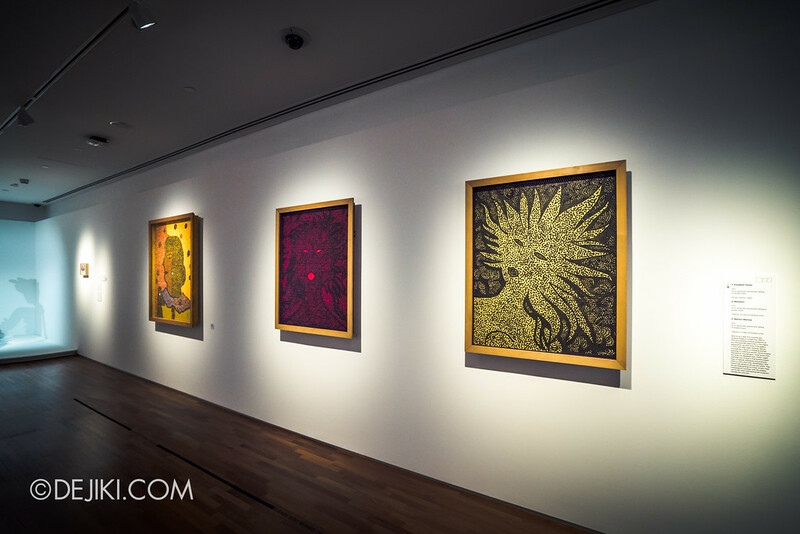 Be careful about the window – don’t hold anything through it because if you drop something… losing your item should be the least of your worries because you may have damaged a very dear piece of art. 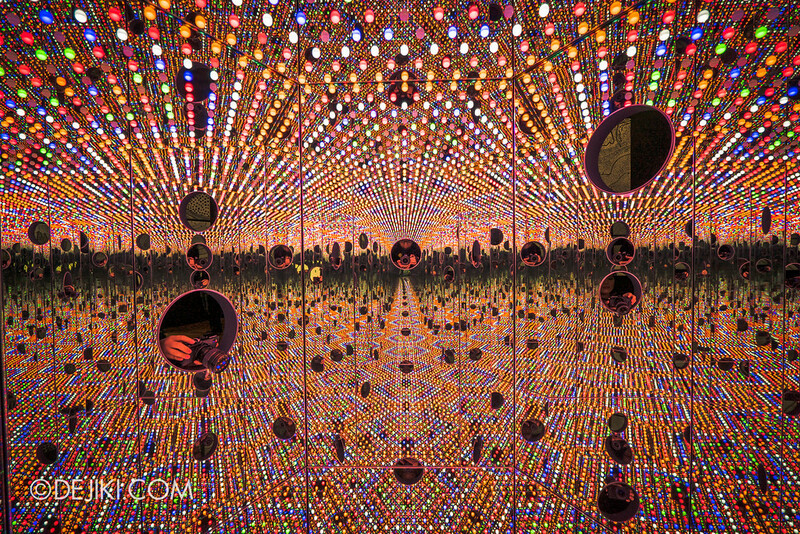 The other installation that you’ll need to wait is the Gleaming Lights of the Souls. 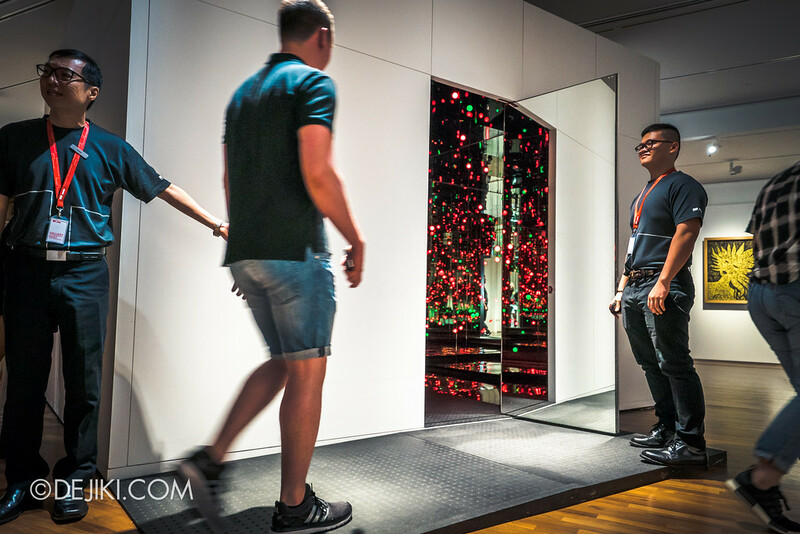 This Infinity Mirrored Room fully encloses visitors in within a box lined mirrors. There’s only a small platform to stand on, and you can bring up to 2 more friends with you inside. Once the door closes behind you, 30 valuable seconds is all you have to drift into the dream of lights. Your soul will not be lost because a few knocks on the door by the Gallery minder will whip you back into this plane of existence. 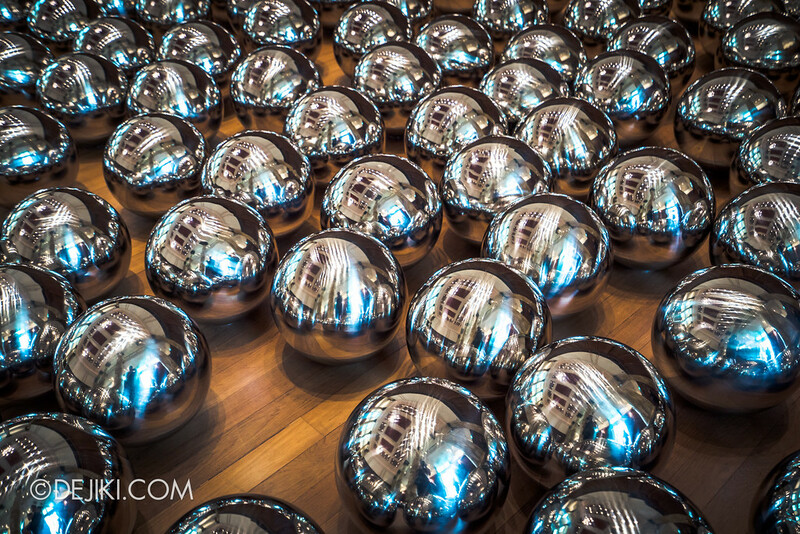 If photos are not enough, bring home some official souvenirs from Gallery & Co. 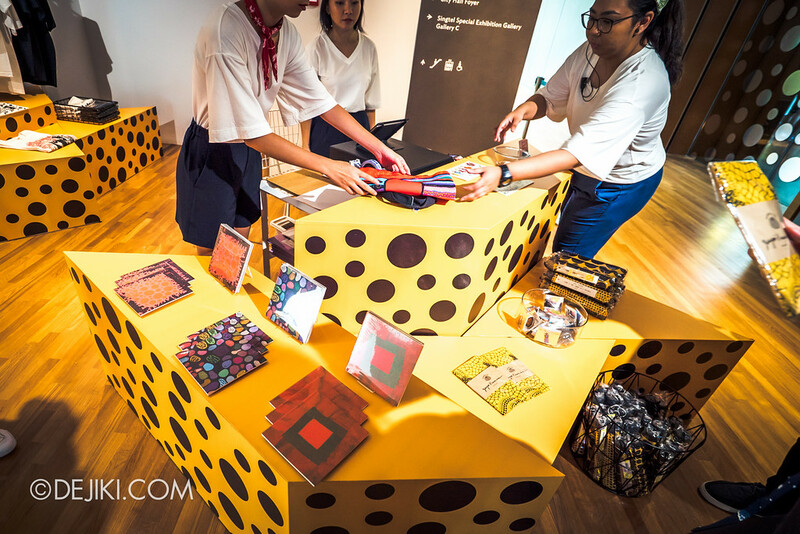 There is a pop-up shop between Galleries B and C. Initially, some enamel mugs and bowls with the iconic Pumpkin motif were available here, but a visitor literally swiped the whole lot before noon. 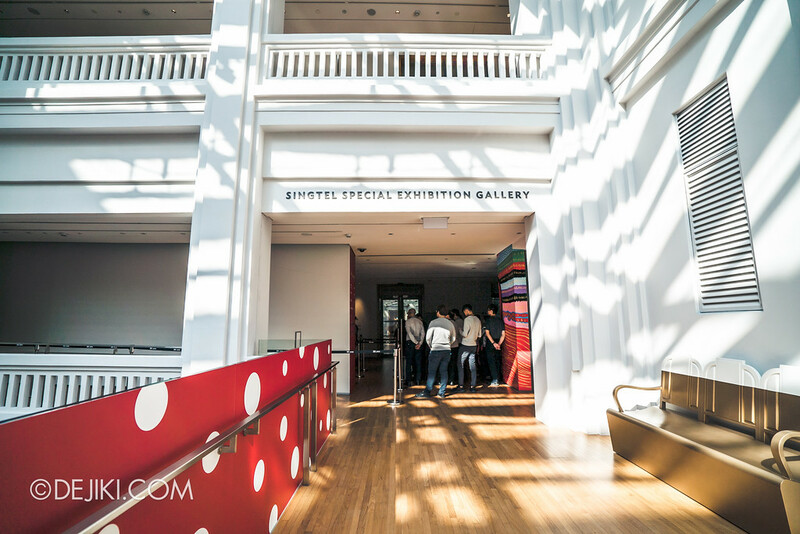 So if there’s anything you want – better grab it fast, otherwise you’ll have to waitlist. 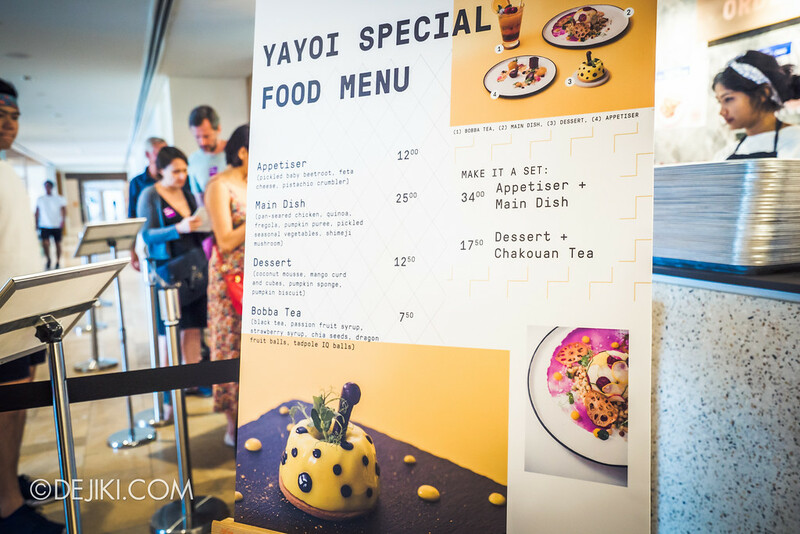 Before you leave the building, check out the Yayoi Special Menu at the Gallery Cafe for a meal inspired by the exhibition. Lovely photos! 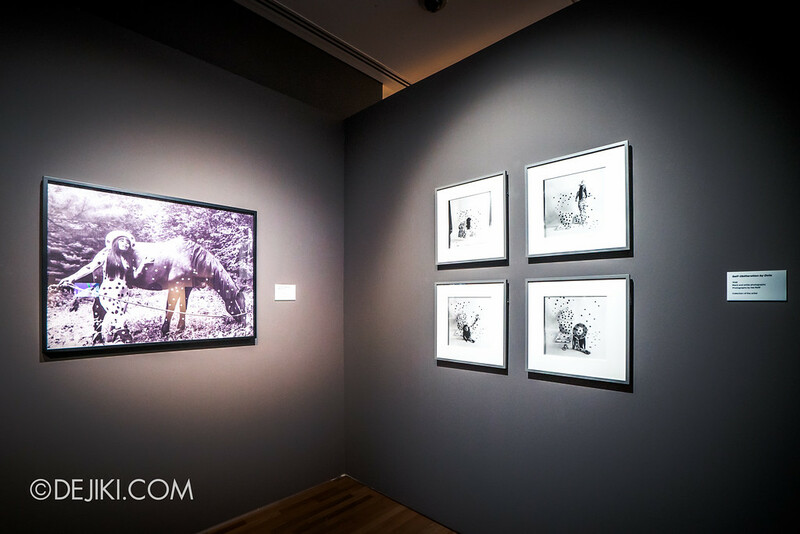 I just went to the exhibition as well and blogged about it too! It was awesome!